Helby's Hatch: "Something that could never ever possibly destroy us"
"Something that could never ever possibly destroy us"
In our home office, we decided to make a large wall collage of various pieces representing our favorite subject - pop culture. Still in the works, but Beetlejuice, Gremlins, Pac Man, Edward Scissorhands, and The Big Lebowski are all represented. And I thought it would be fun to create something other than a print or stitch. So I decided to try my hand at bead embroidery. I found an image I liked online, cropped it to my liking, flipped it horizontally, and printed it on transfer paper. Then I ironed it on to some muslin, and Voila! Stay Puft on fabric. From there, I took seed beads and invisible thread and attached beads four at a time, then relooping through two to make sure they stayed in place. 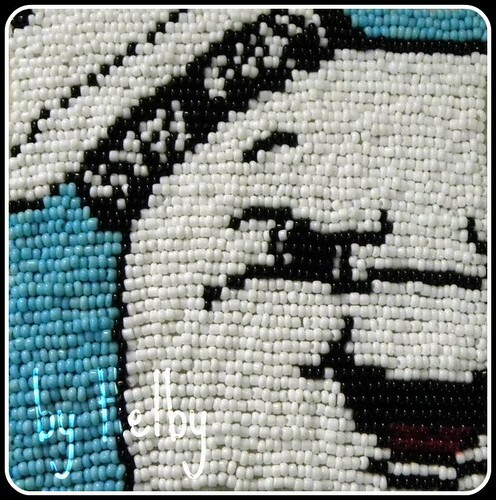 Several hundred beads later and Stay Puft was born! Joe liked it enough to encourage me to do a set. So I now have plans for Slimer, the Ghostbusters logo, and the trap. More things to add to my to-do list! OMG! I love your style and sense of humor, Girlie! I'd love to follow you, but don't see anything but feed-reader do-hickies. If you had a "joind this site with google friend connect button", I'd press it. I may just need to refresh a couple times, though. I'll be checking back. There's a dropdown box that says 'Posts' in the left side bar and you can choose whatever feed you use.